In today’s office, several items may occupy our physical desktop – a computer display (or two or three) and keyboard, writing tools, a blotter pad, a few books, a papers organizer, a radio and … a communications device (traditionally known as a “phone”). But with today’s Internet-enabled communications it’s feasible to want that communications device to go well beyond making voice calls to include support for video calls, listening to a far-off classical radio station, monitoring a broadcast sports event, such as a golf tournament or a soccer match, or watching a YouTube video. be a suitable replacement for that legacy desktop phone? Portability of tablets is one of their primary features. However, when using it in your office, it would be convenient to mount it on a desktop at an appropriate viewing angle to easily follow, say, videos, movies and television events. Listening to music or Internet-based radio broadcasts, in stereo, would also be an option for office activity. Of course the other activity carried out on a desktop is carrying on voice (and now video) conversations. At times the privacy of a handset is appropriate; at other times you may need a speakerphone so that everyone near your desktop can participate in a conversation. If the conversation supports superwideband HD audio, such as Skype’s SILK technology, one wants the full audio crispness associated with this technology. For text typing in social networking applications, the iPad continues to work with a Bluetooth keyboard. 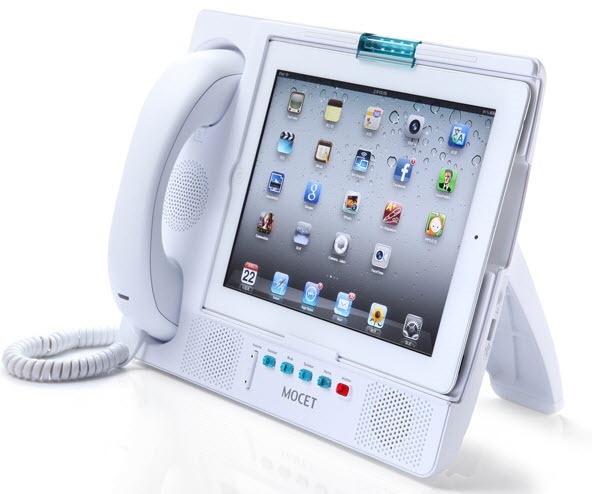 Bottom line: I have found the MOCET Communicator turns my iPad into a convenient companion to my PC desktop PC activity, often offloading many of the activities outlined above from using my desktop PC’s resources. The audio quality is excellent. When not using it for communications activities, it becomes my office radio; occasionally it also becomes an office “TV set” for watching live sports and news events. Yet I can make and receive voice and video calls, using the handset for privacy or using the speakerphone for hands free conversations involving others around a table in the office. And a major plus: it turns the iPad into a flexible desktop audio/video appliance, taking a smaller footprint than a full PC while providing display of video at a comfortable viewing angle. 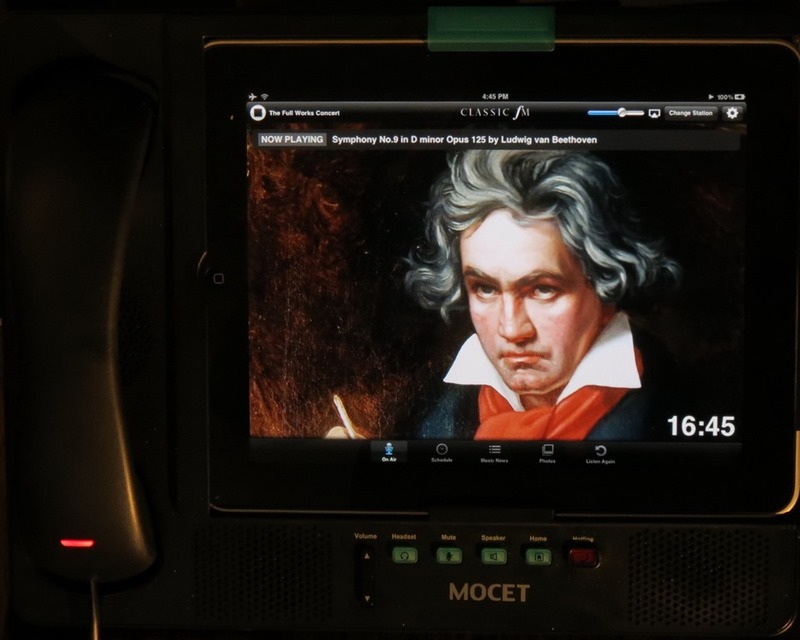 Having it always charged while in the stand removes one significant cause for delay or interruption of activity while using the iPad in the office. …. is a great solution for a remote office with hosted IP services like RingCentral or 8×8 or with an SIP IP PBX whether local or remote. This provides a professional business solution for the SMB user who needs to be able to transfer calls and work with the rest of the users in the enterprise. At US$229.00, available in the U.S. on Amazon, and elsewhere by contacting MOCET directly, it is one communications device option worth investigating for both its convenience and audio performance.